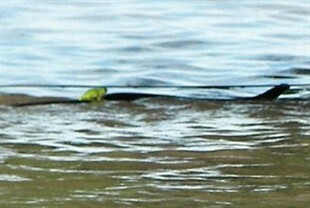 In the animal kingdom, this isn't something you see every day: A green frog hitching a ride atop a brown snake. Computer technician Armin Gerlach was visiting friends in the flood-hit town of Dalby, located in the state's south-east, last week when he spotted the unlikely pair. "I felt amazement, I just couldn’t believe it," Mr Gerlach told ninemsn. Mr Gelach [who took the above photo] said a friend who had been affected by many floods told him animals often helped each other out during disasters. Of course, we don't know the rest of the story. Was the snake really helping the frog? Or was it merely taking carryout for when it found safety? Unfortunately, we'll never know.